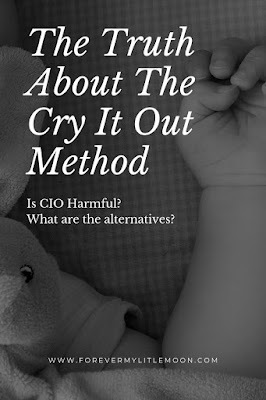 Cry it out or CIO is a sleep training method. It's basically as it sounds, you let your baby cry until they fall asleep. This sounds rather cruel, but when you are a tired mom, you will literally try anything just to get some sleep, so it is easy to see why this method would appeal to some. Besides sounding cruel, is there any harm to the CIO method? Well, that's just it, the science and research behind this method are just not there. Google would tell you otherwise, as you will find tons of articles on this method. The kicker, it's split about 50/50, half of the articles will say it's harmful and half of the articles will say it isn't. Gentle parenting or positive parenting is a relatively new idea and thus it's definition tends to vary depending on who you ask. However, the basic idea is that instead of punishment and rewards, you focus on meeting your child's needs and work together to find a solution. By that definition, CIO does not fit into gentle parenting because you are ignoring your child's needs as you are just letting them cry. Most advocates of gentle parenting are strongly against CIO. Some even called out other positive parenting leaders: Lisa Sunbury, and Janet Lansbury, for encouraging CIO. I am very pro-Science, so it's hard for me to just outright say CIO is bad, as there just aren't enough studies out there to prove one way or the other. Yes, studies do exist, but for every one study that says it is harmful, another says it isn't. The sample sizes are also so small that it makes many of the studies inconclusive. Plus it is hard to get accurate data on CIO as it would be unethical to divide up babies and be like okay use CIO on this half and don't use CIO on this half, so a lot of it is based on asking the parents what they did, which isn't always reliable. However, spanking used to be a common form of discipline and as someone who was spanked and now suffers from long-term, effects of that trauma, it's very hard for me to say CIO isn't damaging or harmful. After all, spanking was treated the same way until studies began being done, and now it's proven to be harmful that countries have even banned the practice and consider it child abuse. This info came too late for me, but not too late for my child. You can read my post on the harmful effects of spanking here. For that reason, I don't think CIO can be ruled out as "safe." I think a lot of people like to think "because it's not proven unsafe, I'll do it," basically the same principle as"innocent until proven guilty," which I think is the wrong mindset when it comes to a lot of things, especially parenting as you are helping shape the mind of a person. Depression, anxiety, etc, all start in our childhood. Young minds are so impressionable and once conditioned, they are very hard to change. My therapist was honest with me and said I would likely always have anxiety. Yes, I can find ways to help lessen it, but at this point, it's unlikely for me to completely free myself from it as my brain has already been conditioned to react in this way. So it wouldn't surprise me if later on, more studies start showing that CIO leads to mental health or behavioral issues later on in teens and adults. After all, they've proven that spanking does. As a gentle parent myself, we found a middle ground as we needed our sleep as well and we didn't feel safe bed-sharing (The AAP does not recommend bed-sharing). Now if it turns out that what we did is later proven to be harmful, I would not advocate for this method at all (unlike many pro-spankers who choose to ignore science). When our daughter started having trouble going down on her own, thinking it was a case of separation anxiety, we turned to Google and found what was called a "Gentle CIO Method." What is the Gentle CIO Method? Basically, you lay your baby down and if he or she cries, you wait a short amount of time (we did 5 mins). If crying hasn't stopped then, you go in, and rock or hold him or her until they calm down, basically reassuring your child that you will come for them if needed, and then try again. In the beginning, this repetition would last a couple hours, but eventually, the amount of time we had to check on her would go down and it eventually got to the point where she didn't cry at all when we laid her in the crib. At one point she started hating being rocked at all and would point to her crib after story time because she just wanted to go straight to bed. I think this method gave her the confidence that if she really needed us, we would come, and helped ease her anxiety. (We were blessed with a fairly easy sleeper. We rocked her to sleep a lot in the beginning before laying her down in her crib. At first I sang lullabies to her, but eventually, we brought the CD player into her room and started playing lullaby CDs (you can my list of recommendations here). I know many gentle parenting leaders recommend bed-sharing if your child is struggling with sleeping on their own, but I have heard too many horror stories and my anxiety would not let me risk it, especially in our American bed. Bed sharing advocates like to bring up Japan as an example, but the way they sleep is extremely different from how we sleep, so our daughter slept in a bassinet by our bed (co-sleeping) for the first 3 months and then transitioned to a crib in her room. I would have loved to keep her in our room longer, but we had no space for a crib or pack n play. Luckily her room is right next to ours and our walls aren't soundproof. We also had a video monitor with sound. There was a short while when she was 19/20 months where she started crying again before bed and we did try to bring her into our bed, as at that point it's pretty safe, but she would not sleep at all. She would just sit and stare, probably because she wasn't used to sleeping in our bed, so the whole, bring them to bed with you may not work if your child is already used to sleeping on their own. So it was back to the gentle CIO method. Luckily it didn't take as long as in the beginning, some nights she passed out right away in my arms and I could quickly lay her down and sneak away without any crying at all! 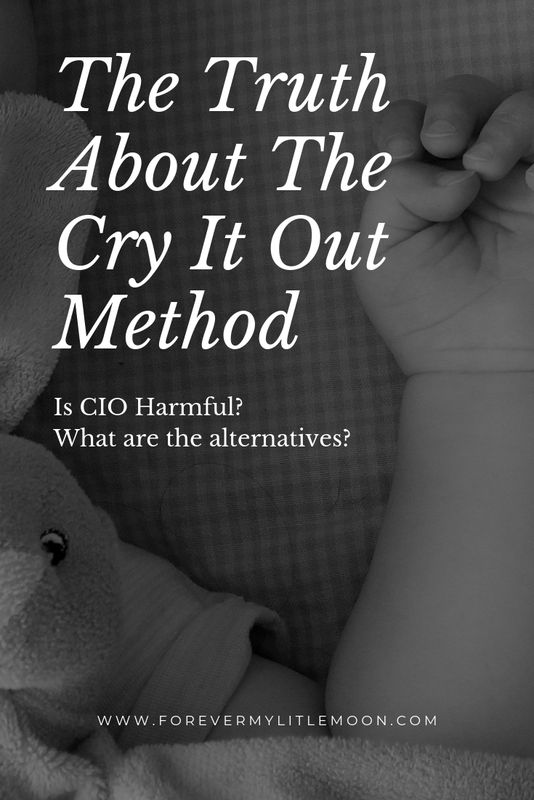 Though there isn't substantial evidence that CIO is harmful, I still would not recommend it and it definitely wouldn't be considered a gentle parenting technique. I think if you are struggling with getting your baby to sleep, Gentle CIO is a better way to go, as you are still checking on your child and you are letting him or her know you will come when they cry. I know the PDF I sourced about how there are no adequate studies is from 2006, but in my research, I couldn't find anything recent that was adequate as well. A lot of the new studies have very small sample sizes, which was a problem with past studies. If you know of any current studies please feel free to send them to me here. I think this sounds too harsh for me. I cannot resist a crying baby! I think being a mother means losing sleep. Well, for me, maybe. I will not recommend CIO too. That's just my opinion. Of course, we have our own unique ways of raising our children, but this one is just not right for me. Thank you so much for the actual research on this! So many things you read are opinion based, which really does no one much good! I know, it was so hard to find unbiased information. It would be great if more extensive studies could be done, but it may take years, just like it did for spanking. I remember those days when my younger one would not let me sleep. Now it's all memories, I can only reminisce. We tried Cry It Out with my first child and I feel we traumatized him. He now has a fear of being alone in a room with the door closed. It wasn't until he was 2 years old that I decided to take a new approach to bedtime and golly did things change for us for the better! We definitely did not take the same approach with our second child. I do not agree with Cry It Out, especially after our experience. 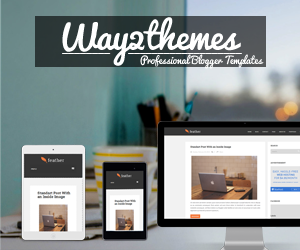 Hi diana, This is a very helpful blog especially for parents and nannies. I didn't know of this information. Thanks for this amazing article. So I had 4 non-sleepers. My girls were so much worse than the boys - they slept through at FIVE! So with both of them we tried the CIO method when nothing else was working. It never actually got them to sleep through but did help to get them to wake less. Honestly both times we were desperate for sleep! We couldn't do it either, which is why we did the gentle method of checking on her every few minutes until she finally went to sleep. Although I let me kids cry, I wasn't quite able to carry through the 'cry it out' method. Great info though! While I would let my babies cry for a few minutes (dude, Mama's gotta go to the bathroom and shower SOMETIME...), I could tell the difference between an "I can handle this, I'm just annoyed" cry and a "I NEED MY MAMA NOW" cry. I remember my cousin crying through a long family party because his parents were working on letting him cry it out. I was probably around 12 at the time and was just sure I couldn't do it as a parent. I haven`t heard of this method before but I am not parent myself. I believe kids need to be let to cry out sometimes, we do it as adults too. Thank you for all the information on this post. May 15th I am having my first baby, I hear about this method all the time. I will have to continue to do my own research since I will have to come to whether to let him "cry it out" or help him through it. I can’t listen to my baby cry, but she’s 6 months and we’ve started to do some gentle sleep training as well. Every time we go in we start with the least invasive soothing method, and climb up the ladder if need be until she’s calmed again, and trying to leave her be before she actually falls asleep. It’s been slightly better. I've heard about this book before and was not so sure about this. But when I tried - I changed my mind! It's totally cool that just few pages of information are changing your life this much this fast. Susan is the best! I've just found this Susan's book. It is short but I decided for audiobook anyway. It's clear and seems easy. We're starting the training this weekend! I'm so excited! It worked so well with my son! Thanks, thanks thanks!!! !